The ground tissue of plants includes all tissues that are neither dermal nor vascular. It can be divided into three types based on the nature of the cell walls. Parenchyma cells have thin primary walls and usually remain alive after they become mature. Parenchyma forms the "filler" tissue in the soft parts of plants, and is usually present in cortex, pericycle, pith, and medullary rays in primary stem and root. Collenchyma cells have thin primary walls with some areas of secondary thickening. Collenchyma provides extra mechanical and structural support, particularly in regions of new growth. Sclerenchyma cells have thick lignified secondary walls and often die when mature. Sclerenchyma provides the main structural support to a plant. Parenchyma (/pəˈrɛŋkɪmə/; from Greek παρέγχυμα parenkhyma, "visceral flesh" from παρεγχεῖν parenkhein, "to pour in" from παρα- para-, "beside", ἐν en-, "in" and χεῖν khein, "to pour") is a versatile ground tissue that generally constitutes the "filler" tissue in soft parts of plants. It forms, among other things, the cortex and pith of stems, the cortex of roots, the mesophyll of leaves, the pulp of fruits, and the endosperm of seeds. Parenchyma cells are living cells and may remain meristematic at maturity—meaning that they are capable of cell division if stimulated. They have thin and flexible cellulose cell walls, and are generally polyhedral when close-packed, but can be roughly spherical when isolated from their neighbours. They have large central vacuoles, which allow the cells to store and regulate ions, waste products, and water. Tissue specialised for food storage is commonly formed of parenchyma cells. Their main function is to repair. In leaves, they form the mesophyll and are responsible for photosynthesis and the exchange of gases. Parenchyma cells in the mesophyll of leaves are specialised parenchyma cells called chlorenchyma cells (parenchyma cells with chloroplasts). Other specialised functions such as aeration (aerenchyma) provides buoyancy and helps aquatic plants in floating. Chlorenchyma cells carry out photosynthesis and manufacture food. The shape of parenchyma cells varies with their function. In the spongy mesophyll of a leaf, parenchyma cells range from near-spherical and loosely arranged with large intercellular spaces, to branched or stellate, mutually interconnected with their neighbours at the ends of their arms to form a three-dimensional network, like in the red kidney bean Phaseolus vulgaris and other mesophytes. These cells, along with the epidermal guard cells of the stoma, form a system of air spaces and chambers that regulate the exchange of gases. In some works, the cells of the leaf epidermis are regarded as specialised parenchymal cells, but the modern preference has long been to classify the epidermis as plant dermal tissue, and parenchyma as ground tissue. The first use of "collenchyma" (/kəˈlɛŋkɪmə, kɒ-/) was by Link (1837) who used it to describe the sticky substance on Bletia (Orchidaceae) pollen. Complaining about Link's excessive nomenclature, Schleiden (1839) stated mockingly that the term "collenchyma" could have more easily been used to describe elongated sub-epidermal cells with unevenly thickened cell walls. Collenchyma tissue is composed of elongated cells with irregularly thickened walls. They provide structural support, particularly in growing shoots and leaves. Collenchyma tissue makes up things such as the resilient strands in stalks of celery. Collenchyma cells are usually living, and have only a thick primary cell wall made up of cellulose and pectin. Cell wall thickness is strongly affected by mechanical stress upon the plant. The walls of collenchyma in shaken plants (to mimic the effects of wind etc. ), may be 40–100% thicker than those not shaken. Collenchyma cells are most often found adjacent to outer growing tissues such as the vascular cambium and are known for increasing structural support and integrity. The term "sclerenchyma" (originally Sclerenchyma) was introduced by Mettenius in 1865. Sclerenchyma is the tissue which makes the plant hard and stiff. Sclerenchyma is the supporting tissue in plants. Two types of sclerenchyma cells exist: fibers and sclereids. Their cell walls consist of cellulose, hemicellulose and lignin. Sclerenchyma cells are the principal supporting cells in plant tissues that have ceased elongation. Sclerenchyma fibers are of great economic importance, since they constitute the source material for many fabrics (e.g. [flax]) hemp, jute, and ramie). Unlike the collenchyma, mature sclerenchyma is composed of dead cells with extremely thick cell walls (secondary walls) that make up to 90% of the whole cell volume. The term sclerenchyma is derived from the Greek σκληρός (sklērós), meaning "hard." It is the hard, thick walls that make sclerenchyma cells important strengthening and supporting elements in plant parts that have ceased elongation. The difference between fibers and sclereids is not always clear: transitions do exist, sometimes even within the same plant. Fibers or bast are generally long, slender, so-called prosenchymatous cells, usually occurring in strands or bundles. Such bundles or the totality of a stem's bundles are colloquially called fibers. Their high load-bearing capacity and the ease with which they can be processed has since antiquity made them the source material for a number of things, like ropes, fabrics and mattresses. The fibers of flax (Linum usitatissimum) have been known in Europe and Egypt for more than 3,000 years, those of hemp (Cannabis sativa) in China for just as long. These fibers, and those of jute (Corchorus capsularis) and ramie (Boehmeria nivea, a nettle), are extremely soft and elastic and are especially well suited for the processing to textiles. Their principal cell wall material is cellulose. Contrasting are hard fibers that are mostly found in monocots. Typical examples are the fiber of many grasses, agaves (sisal: Agave sisalana), lilies (Yucca or Phormium tenax), Musa textilis and others. Their cell walls contain, besides cellulose, a high proportion of lignin. The load-bearing capacity of Phormium tenax is as high as 20–25 kg/mm², the same as that of good steel wire (25 kg/ mm²), but the fibre tears as soon as too great a strain is placed upon it, while the wire distorts and does not tear before a strain of 80 kg/mm². The thickening of a cell wall has been studied in Linum. Starting at the centre of the fiber, the thickening layers of the secondary wall are deposited one after the other. Growth at both tips of the cell leads to simultaneous elongation. During development the layers of secondary material seem like tubes, of which the outer one is always longer and older than the next. After completion of growth, the missing parts are supplemented, so that the wall is evenly thickened up to the tips of the fibers. Fibers usually originate from meristematic tissues. Cambium and procambium are their main centers of production. They are usually associated with the xylem and phloem of the vascular bundles. The fibers of the xylem are always lignified, while those of the phloem are cellulosic. Reliable evidence for the fibre cells' evolutionary origin from tracheids exists. During evolution the strength of the tracheid cell walls was enhanced, the ability to conduct water was lost and the size of the pits was reduced. 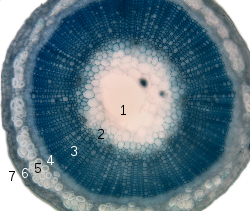 Fibers that do not belong to the xylem are bast (outside the ring of cambium) and such fibers that are arranged in characteristic patterns at different sites of the shoot. Sclereids are the reduced form of sclerenchyma cells with highly thickened, lignified walls. They are small bundles of sclerenchyma tissue in plants that form durable layers, such as the cores of apples and the gritty texture of pears (Pyrus communis). Sclereids are variable in shape. The cells can be isodiametric, prosenchymatic, forked or elaborately branched. They can be grouped into bundles, can form complete tubes located at the periphery or can occur as single cells or small groups of cells within parenchyma tissues. But compared with most fibres, sclereids are relatively short. Characteristic examples are brachysclereids or the stone cells (called stone cells because of their hardness) of pears and quinces (Cydonia oblonga) and those of the shoot of the wax plant (Hoya carnosa). The cell walls fill nearly all the cell's volume. A layering of the walls and the existence of branched pits is clearly visible. Branched pits such as these are called ramiform pits. The shell of many seeds like those of nuts as well as the stones of drupes like cherries and plums are made up from sclereids. These structures are used to protect other cells. ^ Mauseth 2012, pp. 98–103. ^ "Parenchyma". Merriam-Webster Dictionary. Retrieved 2016-01-21. ^ "Parenchyma". Oxford Dictionaries. Oxford University Press. Retrieved 2016-01-21. ^ LeMone, Priscilla; Burke, Karen; Dwyer, Trudy; Levett-Jones, Tracy; Moxham, Lorna; Reid-Searl, Kerry; Berry, Kamaree; Carville, Keryln; Hales, Majella; Knox, Nicole; Luxford, Yoni; Raymond, Debra (2013). "Parenchyma". Medical-Surgical Nursing. Pearson Australia. p. G–18. ISBN 978-1-4860-1440-8. ^ "Collenchyma". Merriam-Webster Dictionary. Retrieved 2016-01-21. ^ "collenchyma". Oxford Dictionaries. Oxford University Press. Retrieved 2016-01-21. ^ Leroux O. 2012. Collenchyma: a versatile mechanical tissue with dynamic cell walls. Annals of Botany 110 (6): 1083-98. ^ Campbell, Neil A.; Reece, Jane B. (2008). Biology (8th ed.). Pearson Education, Inc. pp. 744–745. ISBN 978-0-321-54325-7. ^ Mettenius, G. 1865. Über die Hymenophyllaceae. Abhandlungen der Mathematisch-Physischen Klasse der Königlich-Sächsischen Gesellschaft der Wissenschaften 11: 403-504, pl. 1-5. link.